Whether you’re looking for the perfect venue to say “I do,” party in style to celebrate a milestone birthday or create a unique team-building experience, the staff at the award-winning, independently owned and operated Trump International Beach Resort Miami can turn visions into reality. 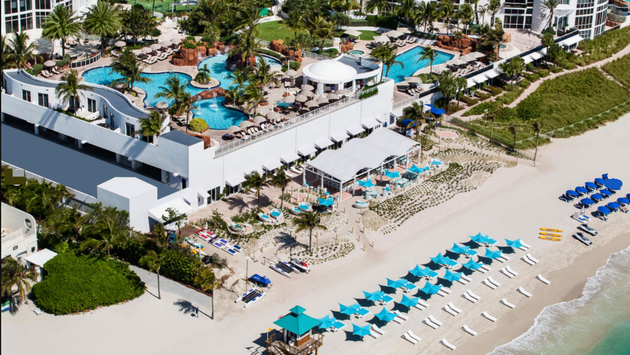 This luxury Sunny Isles Beach resort has the capability to host a wide range of events, from an intimate, barefoot wedding on the sand to black-tie galas for up to 220 guests in the ballroom. For more casual affairs, Gili’s Beach Club, located steps from the sand, can accommodate private oceanside groups of up to 180 people. And for corporate groups, the resort can arrange fun activities such as tug-of-war team exercises, boat-building and sand-sculpting competitions, badminton and bocce tournaments and even beach Olympics. Beachfront - Exchange vows with your toes in the sand on a broad expanse of beach, where up to 200 friends and family members can be a part of your special day. Lower Pool Deck - Ideal for events hosting up to 150 guests, this is a lovely spot for a ceremony, cocktail reception or celebration. Ocean Ballroom - At 5,075 square feet, this stunning ballroom overlooks the Atlantic Ocean and accommodates up to 220 guests seated banquet-style. Bay View Room - Located on the third floor, the Bay View Room features stunning Intracoastal views for up to 220 guests, seated banquet-style. Lawn - Just steps from the white sand beach, this verdant space can be combined with the lower pool deck to welcome groups of up to 220 guests for seaside ceremonies and parties. Gili’s Beach Club - Open-air and oceanfront, this sophisticated spot is the first Sunny Isles Beach restaurant located directly on the sand, and ideal for events of up to 180 guests. From curating the perfect menu, inspired by our emphasis on contemporary American cuisine, to selecting entertainment and design elements, our talented team works behind the scenes to make sure every detail is just right. For more information about hosting your next event, visit www.trumpmiami.com or call 855-807-1933. A 20-plus-year veteran of the hospitality industry, Jim Monastra has directed and executed integrated marketing campaigns for tourism bureaus, cruise lines and the world's most iconic resorts. He currently serves as Director of Marketing at Trump International Beach Resort Miami in Sunny Isles. Born and raised in Cleveland Ohio, Jim has called South Florida home since 1999.